Bustling and thriving on the relatively quiet denizen that is Charlotte Street, there lies a restaurant that oozes gastronomy and is saturated with people who look far too good and, worse, eat much too well. 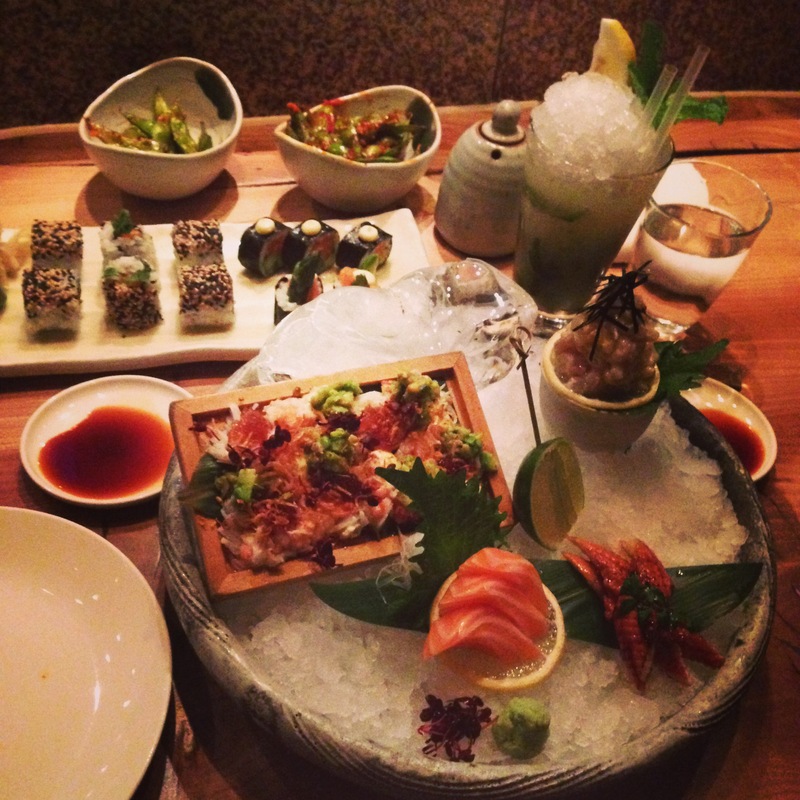 I really love Roka. It’s good sushi. Perhaps a timid review but the pursuit of genuinely good sushi is not an easy venture and certainly not the most fulfilling. However, over a year ago, I ventured towards Charlotte Street and finally took a seat at the “bar” – which is more a low lying table, that is more a feat of wood art, coupled with cozy chairs – which surrounds the great grill. It’s a masterpiece, which lies at the heart of the difference between Zuma and Roka, sister restaurants, where Roka’s focus is not just sushi but the grill too. And just in case that isn’t exciting enough, here’s a side view. As we were seated, we were kindly taken care of by a woman whose name alludes me, but she is tall and has very short blonde hair. Her service is excellent. She took down our order and let us know if we had ordered enough and why the amabi tempura was no longer on the menu – the quality wasn’t good enough – while also making sure our food arrived in good time. While we waited for our sushi, we were invited to partake in some edamame – salted or chilli. In our case, both. You can see the vestiges of our chilli edamame in the upper left of the first photo. The salted edamame is not particularly special, but the chilli edamame is amazing. You would not think that something so seemingly simple could be so brilliant. We ordered it twice. Finally, our sushi arrived. I believe we ordered a salmon maki, eel maki (upper left on plate), and clockwise from top left in the bowl: a divinely fresh crab salad, sea bass sashimi in miso – tart and fresh, beautiful eel nigiri and fresh salmon sashimi. 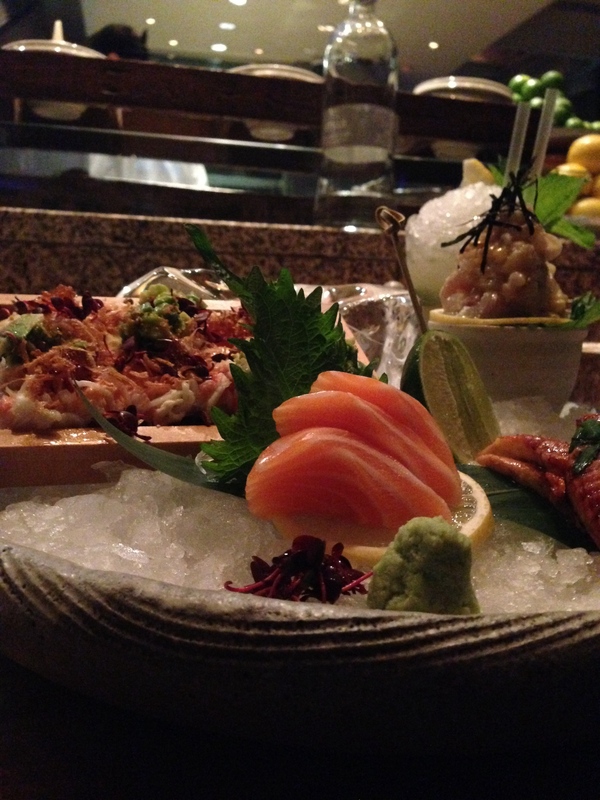 Fresh really is an apt adjective, there is something refreshing and healthy and good about Roka’s sushi. The fish tastes of good quality, it is fresh and its hard to resist the impulse to get more – even if my growling stomach demands it. After the sushi, we were quite satisfied. However, naturally as with all well-fed children, there is always room for dessert. I had the chocolate to macha pudding: a melt in the middle chocolate fondant laced with jivara and complemented by a scoop of pear ice cream. Refreshing and indulgent. Was the sushi good? Yes. The only prevarication is my wallet.